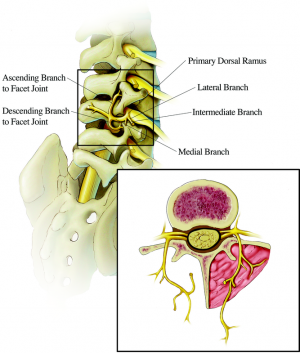 Lumbar facet syndrome means: A dysfunction at the level of the posterior facet joints of the spine. These joints together with the disc form the intervertebral joint. Changes at the level of the posterior facet joints can influence the disc and vice versa. The term ‘dysfunction’ implies that at a certain level (mostly L4-L5 or L5-S1) these 3 components do not function normally. Little capsular tears can originate at the level of the posterior facet joints due to a trauma. This can lead to a subluxation of the joint. The synovia that surrounds the joint is damaged and leads to a synovitis. Secondly a hypertonic contraction of the surrounding muscles present itself. This is a protection mechanism that increases the pain. These changes lead to a fibrosis and osteophyte formation. The most common cause is repetitive micro trauma and as positive result of this chronic degeneration. In daily living this may occur with repetitive extension of the back. So mostly all movements with the arms above the head. These recurring injuries can happen in sports were it is necessary to make repetitive powerful hyperextensions of the lumbar spine. 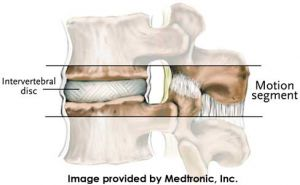 An irritation can also occur when the intervertebral disc is damaged and the biomechanics of the joint have changed. In this case the facet joints are exposed to a higher loading. The affected anatomy in this pathology are the facet joints. The lumbar facet joints form the posterolateral articulations. This is by the connection between the vertebral arch of one vertebra to the arch of the adjacent vertebra.They are more properly termed the zygapophyseal joints. It’s a synovial joint. Each facet joint includes a joint space, which is capable of accommodating between 1 and 1.5 ml of fluid, a synovial membrane, hyaline cartilage surfaces, and a fibrous capsule (1mm). This joint is a potential source of pain. Each level of the spine has a three-joint complex to provide for the joint functions. There are two facet joints in the back and a large disc in front. This provides the stability. in the case of lumbar facet joints, the joints get inflamed. Because of the high compressive forces, facet pain in this area is quite common. LBP is the most common musculoskeletal disorder of industrialized society and the most common cause of disability in persons younger than 45 years, but it can affect people of all ages. (44) Given that 90% of adults experience LBP sometime in their lives, the fact that it is the second leading cause for visits to primary care physicians and the most frequent reason for visits to orthopedic surgeons or neurosurgeons is not surprising. As the primary cause of work-related injuries, LBP is the most costly of all medical diagnoses when time off from work, long-term disability, and medical and legal expenses are taken into account. The lumbosacral facet joint is reported to be the the most common source of mechanical low back pain in 15-45% of patients with chronic LBP. (45) Although, facet joint syndrome is commonly overlooked in patients with chronic low back pain. The authors believe this is because of: (a): the absence of a clinical picture in facet joint syndrome, (b): conventional clinical examination nor radiological examination can diagnosticate facet joint syndrome, (c): only a very small number of doctors perform a manual functional examination to diagnose facet joint syndrome, (d): the diagnostic anasthetic block to confirm the facet joint syndrome is not widely accesible. (46) Ray believed that facet joint–mediated pain is the etiology for most cases of mechanical LBP, whereas other authors have argued that it may contribute to nearly 80% of cases. Thus, the diagnosis and treatment of this entity may help alleviate LBP in a significant number of patients. It’s very important to ask after the following symptoms, this symptoms could include or exclude this diagnosis. If the most of the following symptoms are positive, we can proceed to the next examination. ● The episodes are typically intermittent, and occur a few times per month or year. ● There is more discomfort while leaning backward than leaning forward. ● low back pain from the facet joints radiates down into the buttocks and back of upper leg. (with this test we can to the differential diagnosis with discus herniation). The inspection include an evaluation of paraspinal muscle fullness or asymmetry, increase or decrease in lumbar lordosis, muscle atrophy, or posture asymmetry. The examiner should palpate along the paravertebral regions and directly over the transverse processes because the facet joints are not truly palpable. This is performed in an attempt to localize and reproduce any point tenderness, which is usually present with facet joint–mediated pain. Range of motion should be assessed through flexion, extension, lateral bending, and rotation. Inflexibility of the pelvic musculature can directly impact the mechanics of the lumbosacral spine. With facet joint pathology, the clinician may find an abnormal pelvic tilt and rotation of the hip secondary to tight hamstrings, hip rotators, and the quadratus, but these findings are nonspecific and can be found in patients with other causes of LBP. Patients with facet joint–mediated LBP have normal muscle stretch reflexes. Radicular findings are usually absent unless the patient has nerve root impingement from bony overgrowth or a synovial cyst. ● The pharmacological therapy used by doctors for acute back pains caused by facet joint syndrome is based on administrating muscle relaxants. ● Standard treatment modalities for facet joint syndrome pain include intra-articular steroid injections and radiofrequency denervation of the medial branches innervating the joints. Yet there is much controversy in scientific articles related to this standard treatment. Cohen S. P. et al. (2007) investigated several publications about the effectiveness of intra-articulair steroid injections and radiofrequency denervation of the medial branches. In uncontrolled studies of people that have never been diagnosed for facet joint syndrome, the long-term relief of back pain after intra-articular steroid injection varies from 18% to 63%.In controlled trials, the results are disputable. In the largest study, the investigators reported no significant difference in outcome between the patients who received large-volume (8 ml) LA and steroids injected into facet joints or around facet joints or intraarticular saline injections. Cohen S. P. et al. (2007) also verified that radiofrequency denervation of the medial branches innervating the joints, is an effective treatment for facet joint syndrome. Unfortunately, there aren’t enough studies that follow the same protocol, to make a conclusion about it. Pain relief : Physical therapy includes instruction on proper posture and body mechanics in activities of daily living that protect the injured joints, reduce the symptoms, and prevent further injury. Now you can start with the exercises. The purpose of the ADIM is to voluntarily activate TrA thickening and lateral slide while obliquus internus (OI) and externus (OE) should remain relatively unchanged. There is some evidence that ADIM exercises may reduce onset deficits and pain (36). 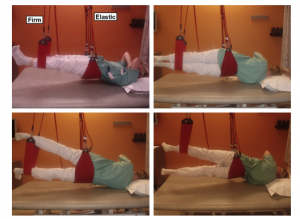 -high load specific exercises : Sling exercises for the lumbopelvic area were performed using the Redcord Trainer. With emphasis on controlling the lumbar spine in a neutral position the subjects performed pain free exercises in closed kinetic chain and under increasing loads. : The overall goal was to improve muscle strength and neuromuscular control. Elastic ropes attached to the band supporting the pelvis were used to ease the load and help subjects maintain a neutral spine position at all times, and for exercises to progress without pain. Exercise progression was achieved by gradually reducing the elasticity of the ropes or increasing the distance (torque) to the distal band. As therapist you can do passive modalities. You can mobilize the lower back of your patient. In a later stage of the therapy, you can manipulate the lower back. Lumbar facet syndrome means: A dysfunction at the level of the posterior facet joints of the spine. These joints together with the disc form the intervertebral joint. Changes at the level of the posterior facet joints can influence the disc and vice versa. The term ‘dysfunction’ implies that at a certain level (mostly L4-L5 or L5-S1) these 3 components do not function normally. The first thing you need to do is focusing on education, relative rest, pain relief, maintenance of position that provides comfort, exercise and some modalities. 8. ↑ Mens J.M.. The use of medication in low back pain. Best Pract Res Clin Rheumatol. 2005; 19;609–21. 10. ↑ Lilius G., Laasonen E. M., Myllynen P., Harilainen A., Gronlund G.. Lumbar facet joint syndrome. A randomised clinical trial. Journal of Bone and Joint Surgery. 1989;4;681-684. (51) Ray C, MD, symptoms and diagnosis of facet joint problems, spine health, 2002.